Fueled by a growing middle class with an appetite for consumer products, and now, the money to pay for them, dynamic changes are taking place in the import/export industry. For example, China became the top importer of U.S. agriculture goods in 2010, surpassing all other nations for the first time in history. An increase in exports to China means more job opportunities for American workers, farmers, ranchers and service providers, as well as sustained economic growth. 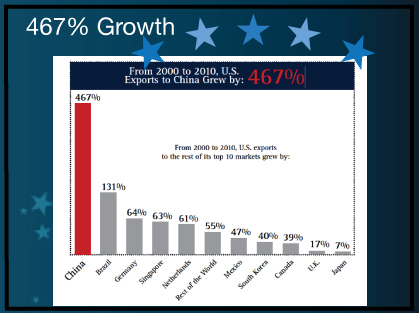 China’s potential is so great that capturing an additional one percent of the China import market translates to $12.6 billion in additional goods exports and more than 74,000 U.S. jobs. 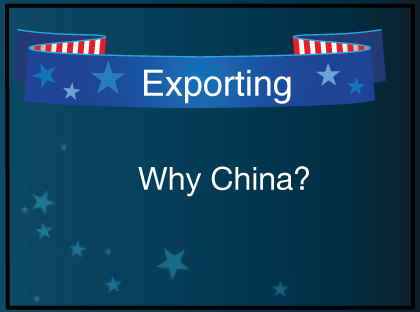 Much of America’s recent export resurgence can be attributed to China – the nation’s fastest growing major export destination and third largest by volume. In 2010, the U.S. exported $93 billion worth of China-bound goods, more than a 30 percent increase over the previous year and outpacing worldwide export growth by a double-digit margin. 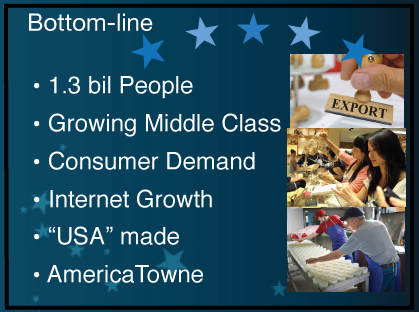 Those exports to China translate into supporting about 500,000 jobs in the U.S. in 2010. 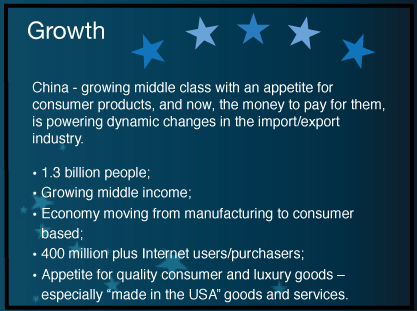 The Chinese market boasts a growing middle class, which McKinsey & Co. expects to reach 400 million by 2020, and ever widening consumer base offers a compelling destination for U.S. small-and medium-sized enterprises (SMEs) to boost exports and expand their business. Though many small businesses are reluctant to seek new opportunities overseas, a growing number of U.S. SMEs are doing business in China – and are finding success.